I spoke with Blair Ogburn, senior naturalist at Balsam Mountain Trust, the other day and she related a perplexing incident. She said she was leading a group on a nature hike when she heard a blue-winged warbler. Now, blue-winged warblers have a really distinctive song. The Peterson field guide describes it as “… a buzzy beeeee-bzzz as if inhaled and exhaled.” But with a little spit, it would be a perfect Bronx cheer. Blair, who was without binoculars, borrowed some from one of the hikers and scoured the brushy field where the song was coming from. She couldn’t find a blue-winged warbler anywhere. She did, however, find a golden-winged warbler – and that was the songster. Ron Davis, assistant natural resources professor at WCU, and I had a meeting at Balsam Mountain Preserve last Friday and took a little timeout to search for the bird. We found it again still singing the blue-winged song but with an occasional alternate song that was more like a golden – winged. This is the second time in the past few years that I have observed this phenomenon. Bob Olthoff and I ran into a golden-winged singing the blue-winged song along Max Patch Road – it seems like it was in 2006 or 2007. The typical first generation cross between a golden-winged and a blue-winged is known as a Brewster’s warbler. The Brewster’s was first thought to be a separate species. One of the common backcrosses is the Lawrence’s warbler. Each species and all the hybrids are capable of singing the common blue-winged song, the common golden-winged song and/or a number of variations of the two. And hybrids are likely to mate with either of the original species. As early as the middle of the last century, the two warblers had fairly distinct ranges with little overlap. The blue-winged was found across the central-Midwest (Missouri, southern Illinois, southern Iowa, southern Indiana, Tennessee and Kentucky.) The golden-winged resided in the eastern U.S., New England and into Canada plus down the Appalachians to north Georgia and North Carolina. 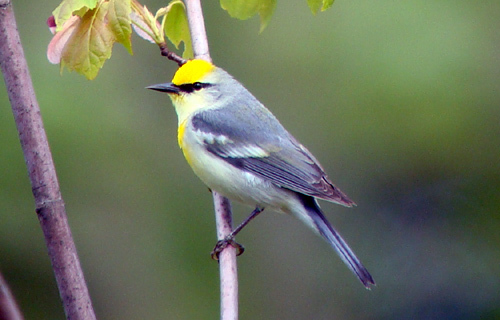 Both species use early-successional habitat and as land uses began to change with more small eastern and New England farms reverting to scrub and woodland, blue-winged warblers began to expand their habitat eastward and northward and this march appears to be extirpating golden-winged warblers from these regions. Golden-winged populations are declining rapidly and hybridization is thought to be one of the causes. The blue-voiced golden-winged was still with us as of last Saturday when the small group from the Great Smoky Mountains Audubon Chapter (GSMA) that I was leading stopped by. We got some pretty good looks and maybe he will stay through next Saturday (May 7) so our “Birding for the Arts” group will also get good looks. This annual Haywood County Arts Council fundraiser is a great excuse to get out on a spring day, enjoy the mountains, see some really cool “performers” and help support all the great Arts Council programs. Space is limited so call the arts council at 828.452.0593 to sign up. Joe Sam and Kate Queen and I look forward to seeing you there.